Neither did Lucy Cohu (Madame Maigret), Shaun Dingwall (Janvier) and Leo Staar (Lapointe). Or executive producer John Simenon, the son of the author. 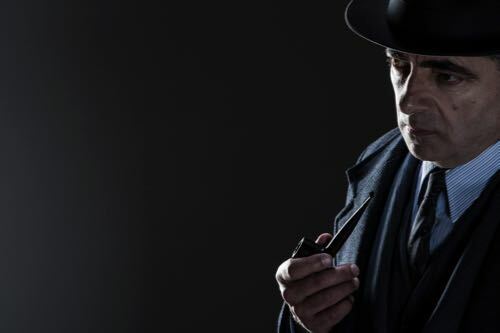 Maigret Sets A Trap is the first feature-length stand alone story, set in 1955. To be followed later this year by Maigret’s Dead Man. Both screenplays written by Stewart Harcourt, who was also responsible for the recent classic ITV film Churchill’s Secret. With producer Jeremy Gwilt bringing the stories to the screen. Ashley Pearce directing the first and Jon East the second. I read the scripts for both Maigret films before flying out to Budapest. And saw the beautifully filmed opening two-hour production at the London launch earlier this month. This is top class television drama destined to intrigue and delight viewers across the globe as it weaves its magic on screen. As John Simenon told me in Budapest: “Rowan Atkinson is probably going to be one of the truest Maigrets ever. “Because he really expresses a unique sensitivity to others, an empathy that is so important. “It’s about the human condition and what my father called ‘the naked man,’ separate from all the particularities of time, space and other circumstances. Scroll down for more production photos by Colin Hutton. Rowan Atkinson and John Simenon at the London launch. Shaun Dingwall (Janvier) and Leo Staar (Lapointe). Maigret (Rowan Atkinson) and Madame Maigret (Lucy Cohu). Posted in News and tagged Aidan McArdle, Ashley Pearce, Barnaby Thompson, Budapest, Colin Hutton, Colin Mace, Drama, Ealing Studios, Georges Simenon, Hungary, ITV, Janvier, Jeremy Gwilt, John Simenon, Jon East, Jules Maigret, Lapointe, Leo Staar, Lucy Cohu, Madame Maigret, Maigret, Maigret Productions, Margret Sets A Trap, Margret's Dead Man, Paris, Rowan Atkinson, Shaun Dingwall, Stewart Harcourt. Bookmark the permalink.